Create your own personalised Samsung Galaxy S7 Edge full wrap case. 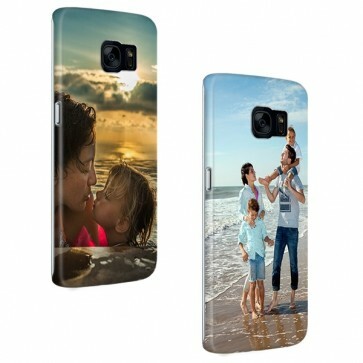 Choose a photo or custom design for your cover. Protect your mobile in style. A personalised phone case built uniquely for your Samsung Galaxy S7 Edge. Have you been looking for a phone case sometime, but you find most cases extremely boring? Why not make your own phone case? The Samsung Galaxy S7 Edge full wrap hard case is made of polished plastic that offers reliable protection to the sides and rear end of the device. Hard cases specialize in preventing permanent scratches and damage to your phone. We believe that protection is one of the most important things a smartphone should have, but we also believe that phones should look stylish too! Instead of having a plain phone case, why not aim for a personalised phone case? Your order will be printed with a 3D printer using high quality ink, meaning that your image will be scratch resistant! Your device will not feel any less comfortable in your hand than before, as we’ve made the case light and easy to grasp onto. We’ve also created openings in the case where all buttons, speakers and ports are located, so you can easily listen to music while charging your phone! Make your own phone case using an image you love. Using our editor, you can make your personalised phone case as crazy as you want. You can easily upload photos directly from Facebook, Instagram or your PC and edit it afterwards with our large assortment of tools. It only takes a few steps to complete your design, but don’t feel the need to rush. Take your time and make the necessary changes to create the perfect accessory. Reposition, rotate and resize your image and to top it all off, choose one of our fonts and add a meaningful text right on top. We have a large catalogue, so you can find full wrap hard cases for other smartphone models. Would you like to make your own personalised phone case for the Samsung Galaxy S7? Then click here! A custom phone case you can share with everyone! Creating a personalised phone case for your Samsung Galaxy S7 is something you should be proud of, so you can easily share you design with your friends and family on Facebook. Once you’ve created your design and checked out, simply click on the Facebook share button! While your friends will be admiring your design, we’ll be hard at work printing your order. By using advanced printing techniques and high quality ink, we can print your order very quickly and sharply. You can expect your personalised phone case to be at your doorstep in no time. You don’t even need to wait at home for your order to arrive. We use standard shipping, so your personalised phone case will be placed directly in your mailbox. So what are you waiting for? Make your own phone case today!